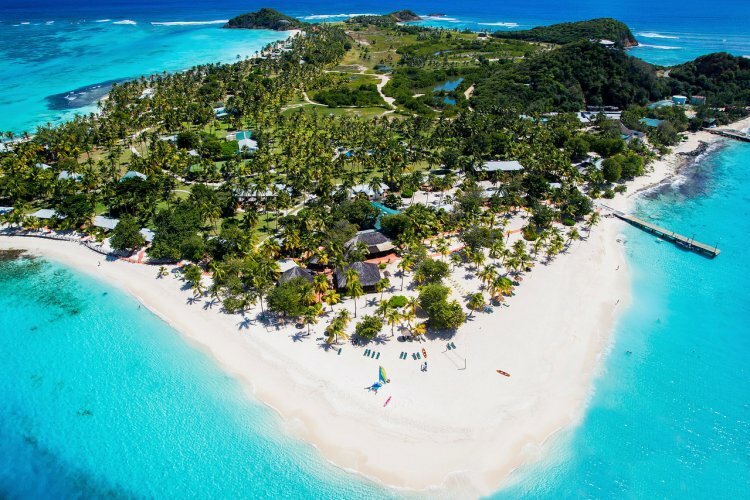 Palm Island Resort is an exclusive private island resort located near the southern tip of St Vincent and the Grenadines. Set amongst the natural untouched surroundings, the resorts 41 guest rooms and 2 villas offer an idyllic tropical hideaway only accessible by boat. Five white sandy beaches surround the resort so you can enjoy a number of activities on both the sea and sand. Exotic sea life and rainbow coloured reefs make this a divers' paradise and there are a number of excursions and nature trips to enjoy. The Palm Island Resort has all the amenities and activities to suit every guest and this all-inclusive resort allows you to do as little or as much as you like. Daily afternoon tea, weekly manager's cocktail parties and beach barbecues are all opportunities to sample some of the fantastic food and drink on offer. If you like to keep active the resort has many complimentary facilities such as tennis, table tennis, croquet, cycling and non-motorised watersports. If you are looking to be pampered in paradise you can enjoy a luxurious massage and Guest Services are able to assist in organising excursions. 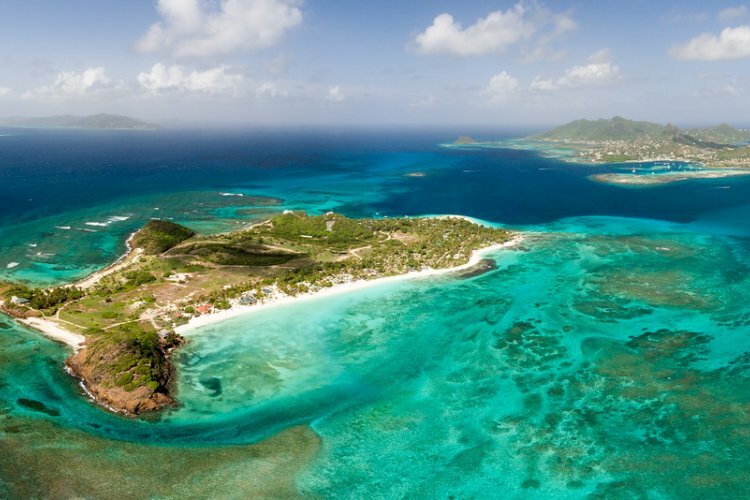 Try scuba diving, fly fishing or a romantic sail at sunset and as the beach is just a few steps away you can lounge on the sand or enjoy a walk along the many nature trails. It's the perfect island for a digital detox with no televisions or telephones in your room and the beach is a strictly no mobile phone zone. The Palm Island Resort offers a choice of rooms, suites and villas all of which are well appointed and decorated with relaxation and comfort in mind. The Palm View Rooms are set in the gardens and include a furnished terrace overlooking the pool or garden whilst the Beachfront Rooms offer stunning views of the Caribbean and nearby Union Island. The Seagrape Suites offer ample space for you to relax in and include a separate fitting area, king sized beds and a bathroom with a double shower. The resort also has two villas with the Southern Cross villa offering two bedrooms, a tiled dining terrace and private infinity edge swimming pool. The Sea Father Villa is located on the northern shore and has three bedrooms and a vast entertaining covered deck next to the water's edge.Villa guests also have the use of a golf cart for easy access around the resort (with valid drivers license). The two restaurants in the resort serve a choice of delicious meals inspired by the herbs and vegetables grown on the island.If you want to enjoy a romantic dinner head to the Royal Palm restaurant which has beautiful ocean views. For relaxed dining and to sample a cocktail or two visit the Sunset Grill where you can enjoy a relaxing yet social atmosphere. This 4½ star resort has a great choice of accommodation and daily activities and excursions so if you are looking for the perfect romantic getaway or honeymoon destination on a private island then the Palm Island Resort & Spa is the ideal choice. 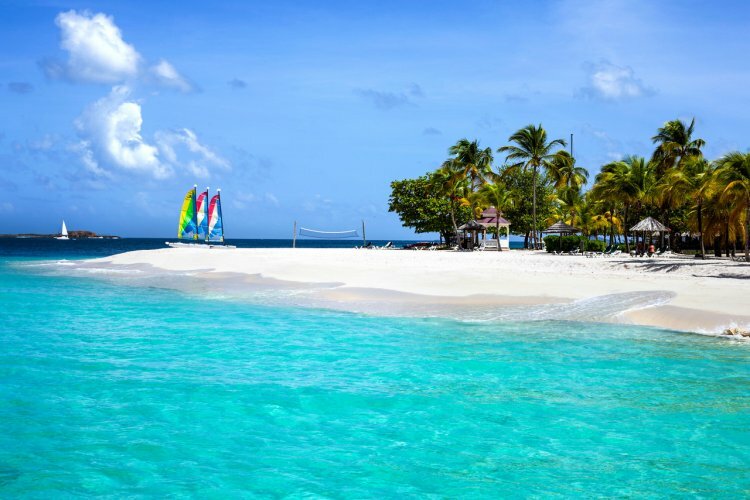 Vistors can reach the Palm Island Resort with a flight from either Grantley Adams International airport in Barbados or Hewanorra International airport to St.Lucia to Union Island followed by an 8 minute boat ride to the resort.